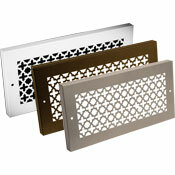 Steel Crest Decorative Baseboard Grilles come in a stunning Victorian style that will modernize your home or business. Our decorative baseboard grilles are made with steel for durability and are finished with a powder coat. The grille remains open to allow constant air flow in your space. They are simple to install and ready for when you need them. Steel Crest Decorative baseboard grilles come with screw holes that you can easily use to mount the baseboard grilles onto the wall. Steel Crest decorative baseboard grilles are made in the USA. We offer these Steel Crest decorative baseboard grilles in two sizes and three finishes. 14" x 6" 16" x 8"
30" x 6" 32" x 8"
Product Tip: Do not measure your old/existing baseboard return, measure the size for the hole opening to determine the baseboard return size. For example a 14" x 6" baseboard grille is made for a 14 x 6 hole and the overall faceplate would be 16" x 8". 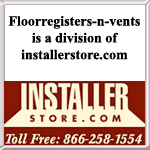 If you are looking to purchase stocked floor registers, Steel Crest Oil Rubbed bronze is most comparable to the Wicker Oil Rubbed Bronze finish and the Steel Crest Silver finish is most similar to the Wicker Satin Nickel finish. For more baseboard options you can view our array selections of baseboard registers, baseboard grilles and Steel Crest Decorative Baseboard registers. You may also view the full line of Steel Crest Products that is available. Update your space with our Steel Crest decorative baseboard grilles at an affordable price with our low shipping rate!